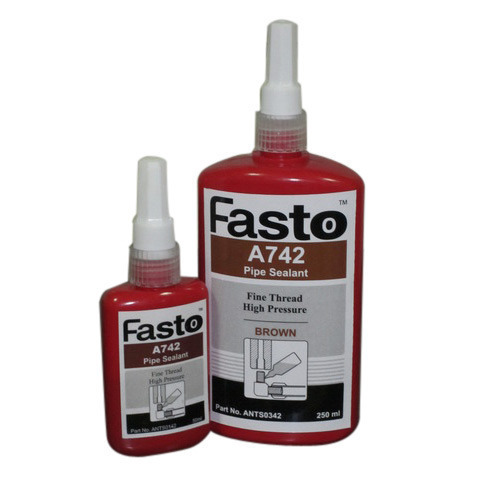 Item Code: Fasto-A742 Fasto A742 is recommended for sealing fine threads of Hydraulic/Pneumatic connections. It seals up to burst pressure of pipe. A742 offers excellent chemical resistance also. Fasto A742 is recommended for sealing fine threads of Hydraulic/Pneumatic connections. It seals up to burst pressure of pipe. A742 offers excellent chemical resistance also. Industrial & Construction Solutions began its operations in the year 2014, as a distributor and supplier of M/s.Henkel Adhesive India Pvt Ltd. M/s. Fasto Advanced Adhesive Technologies and M/s. Speb Adhesive Pvt Ltd . The ownership type of the company is Sole Proprietorship and we have situated our operational head at Coimbatore, Tamil Nadu (India). We are offering wide range of Construction Adhesive, Construction Polymer, Flange Sealant, Pipe Sealing Adhesive, Cyanoacrylate Adhesive, UV Curing Adhesive, Retaining Compound ,Synthetic Rubber Adhesive ,Epoxy Potting adhesive,PU Foam spray ,Metal Bonding Adhesive, Flange Sealant, Pipe Sealing Adhesive, Cyanoacrylate Adhesive, UV Curing Adhesive, Retaining Compound ,Synthetic Rubber Adhesive, Medical Grade Adhesive ,Silicone sealant, High temperature adhesive, Polyurethane Foam spray, Polyurethane sealant, Paintable sealant, Food Grade Silicone Sealant, UL Epoxy, Clear Potting Epoxy, Transparent Potting Epoxy, Medical Grade UV Adhesive, Medical Grade Cyanoacrylate, Approved FDA approved Adhesive, Metal bonding adhesive, Polypropylene bonding adhesive,Water Based adhesive,Henkel D2 Henkel D3, Henkel d4, Henkel Membrane Adhesive ,Edge bonding hotmelt , Henkel Lamination Adhesive, hot melt Adhesive. These products are manufacture by our vendors utilizing the finest raw material and modern machines. We are also providing Adhesive Coating Service to the customers. Further, the offered range is known to be marked at the most competitive leading prices. We upgrade our facility on a regular basis, to make our path to the top of the chain in this competitive market. Further, we deliver the products in the market after the stern check on the quality under various parameters. We ensure that the customers are completely satisfied with the quality of the products and tier prices.